From her early classic Three Lives to her best-selling Autobiography of Alice B. Toklas to Brewsie and Willie, a loving tribute to the G.I.s who adored her, Gertrude Stein's work was among the most controversial of the modernist movement. Alternately praised and derided, emulated and ridiculed, Stein was as unique a celebrity as the mass media of the early 20th century ever produced. As her influence spread through the lost generation she nurtured, critics from Edmund Wilson to confidant Carl Van Vechten defended her experimentation against the slings and arrows of the literary establishment. At the same time, Stein found herself parodied and caricatured from the pages of the New York Sun to the New Yorker. Her reputation solidified only after her 1946 death from cancer prompted a series of reminiscences and reestimations from the Chicago Tribune to the Saturday Review. 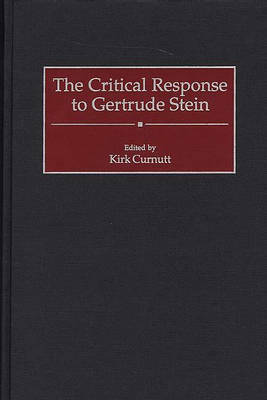 While previous collections of Stein criticism typically reprint commentary by her most ardent supporters, this study reconstructs her precarious position in the eyes of American newspaper and magazine columnists and is thus a guide to her critical reception. While including quintessential pieces on Stein by Carl Van Vechten, William Carlos Williams, and Katherine Anne Porter, this collection also includes previously obscure estimations from contemporaries such as H. L. Mencken, Mina Loy, and Conrad Aiken. The book borrows from a range of sources-from leading literary outlets such as the New Yorker to a number of regional newspapers. Some 75% of the material in the volume has never before been reprinted.